I bought this out of curiosity as I haven't seen anything mentioned about the Lush Temple Balms, but I'm really glad I picked it up. For a whole night of restful sleep, you can use a Dreamtime Bath Melt and the Balm on your temples. Keep a tin by your bedside for when you wake up at the wrong time. Have another dream-inducing pot of Lavender, Chamomile, Sandalwood and Jasmine balm in your pocket, so that you can fall asleep on planes, trains and anywhere else you fancy a nap. If you follow me on Twitter then you'll know by now, I have awful trouble sleeping. I'll try anything once if it promises a somewhat restful night. I'm not the biggest fan of Lavender. I really dislike it, so it was kinda of stupid of me to buy this, no? But it contains lots of other lovely ingredients such as Jojoba oil, fresh Rose petal extract, Jasmine Absolute and Chamomile flower. This makes it so the lavender isn't overpowering over everything else. On the site, Lush suggest you can use these on your temples, pulse points and on the inside of your nostrils. I do just do that and does it help me sleep? Well, I wouldn't solely rely on this but it definitely relaxes me and helps me feel sleepier more easily, which is more then I expected! 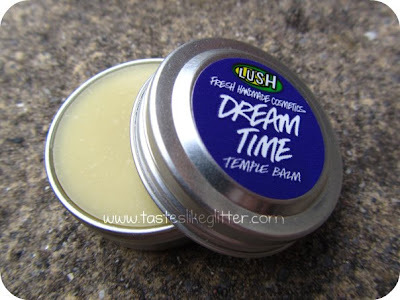 Have you tried any of the Temple Balms? What did you think? Or is it something you would pass on?